Paris high level meeting on Xylella fastidiosa. EU ministers and Commissioner Andriukaitis agreed on a roadmap to tackle the bacterium. On November 30 and December 01, 2017 a high level meeting to discuss the issue of Xylella fastidiosa has been held in Paris. 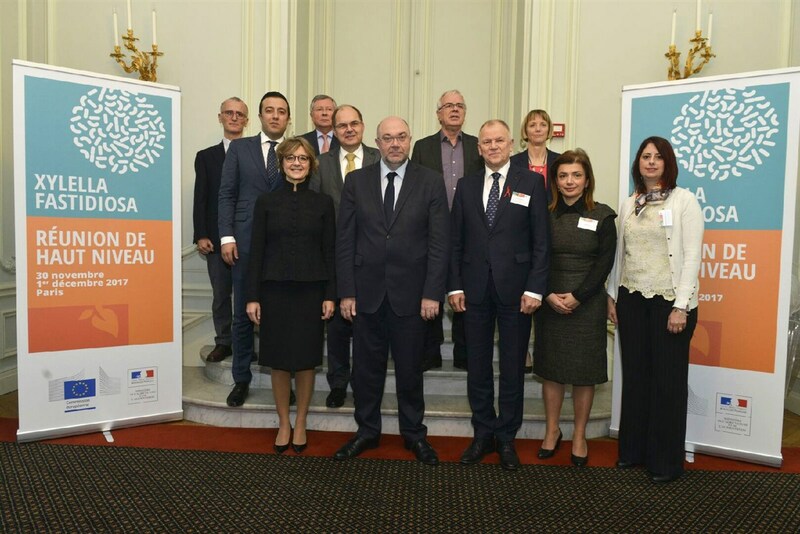 The meeting was organized by the French Ministry of Agriculture and the Directorate General for Health and Food Safety of the European Commission. The meeting was attended by the EU Commissioner Vytenis Andriukaitis and the Ministers of Agriculture from the ten European Member States most concerned by the bacterium (Italy, Spain, France, Germany, Greece, Croatia, Cyprus, Malta, Portugal and Slovenia). improving knowledge through the support of research programs. strengthening surveillance to ensure the early detection and rapid eradication of potential new outbreaks. reinforcing awareness and information actions. (One of the first actions already planned is the launch in early 2018 of a vast information campaign aimed at the general public and especially targeted to travelers). The European Food Safety Authority (EFSA) provided the conclusions of the European research conference on Xylella fastidiosa held in Palma de Mallorca on 13-15 November 2017 (click here for the Ppt presentations and the book of abstracts). The report of the meeting by EFSA is available here. Eppo (European and Mediterranean Plant Protection Organization) and Inra (French National Institute for Agricultural Research) – partners of XF-ACTORS consortium – participated to the meeting providing contents on the current knowledge about ecosystem interaction and regulations, and the available diagnostic protocol. The press release (in French language) has been published on the website of the French Minister of Agriculture. The key points discussed have been reported by the European Commission and are available (in form of key conclusions and detailed conclusions) on the website of DG SANTE, along with the latest developments of Xylella fastidiosa in the EU territory. Picture is courtesy of the official Twitter account of the French Ministry of Agriculture.